I would like to introduce you to my daughter. That is soooo weird to say. But, I am most definitely on my way to being a parent; pictures don’t lie. Last Thursday, daddy-to-be and I drug ourselves out of bed at a first shift hour to attend our 20 week ultrasound. I pounded 16 ounces of water and prepared myself not to pee for a while. We were excited, maybe a little nervous and quite sleepy. Totally worth it. It was so different than the scan we had at six weeks. What was then a funny looking little bean-shaped thing now appeared on the screen as a spine, ribs, a head and finally (phew) four limbs. It’s like there’s a small human in my abdomen, which I suppose there is. 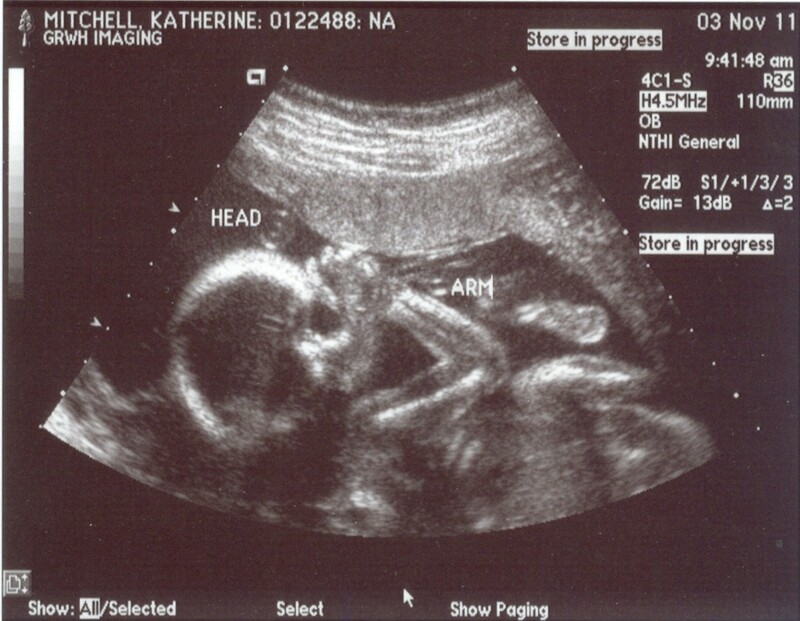 The tech was initially a bit concerned that we may need to return for a second ultrasound. The baby was not positioned in a way that could give her a good look at the heart… or between the legs. Obviously, analyzing this person’s heart is of more importance to us than the gender, but having that “boy or girl” answer was definitely more exciting for the masses. But a welcome trip to the bathroom moved things around just enough, and we saw four chambers and, apparently, no boy bits. Now we have the first actual photos of our healthy child in our hands, and can still hardly believe it. I do feel the little lady move around every now and then, but the sensation could still be mistaken for gas or a muscle twitch most of the time. Veterans assure me that the kicks will be more pronounced shortly. We do not have a name yet, but will keep thinking, and keep a masculine version on the list… just in case. Thank you for being among the first to allow me to open my virtual wallet and show off. It’s pretty fun. 8 Responses to Meet Miss M.
We are absolutely THRILLED, Katherine! What a little miracle! I love the way you express yourself in writing. You are going to be such a good little mommy. The thought of my little girl becoming a mommy is such a blessing! Just wait. You’ll understand fully why I am, and always have been so taken by this miracle of human life. Are you doing a gift registry for the baby-to-be? This would be a great place to post a link (hint, hint). This would be fun for me and my wife. Our daughter just turned two, officially graduating to toddler. Infants being especially precious in winter. I know I’m definitely looking forward to a little one cheering up these Michigan winters. Cannot congratulate you enough. She’s in good hands. Well, a belly right now.